Wow… just… wow…. That’s ugly. 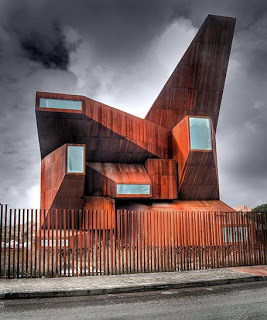 At the Italian site Fides et Forma, Francesco Collafemina has posted photos of supremely ugly churches. This church is called Santa Monica. I don’t think St. Monica or her son would be amused. Well.. not, that one. Though I actually like it better. 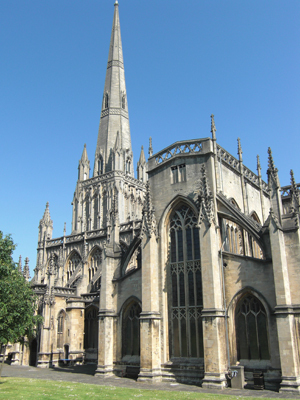 And since this stuff might give you bad dreams, here is a photo of a nice church that looks like a church …. in Tuscany. 46 Responses to Wow… just… wow…. That’s ugly. I was actually thinking of the Jawa Sandcrawler when I saw the second photo. Then when I scrolled down to see the third picture, I burst out laughing to see that you actually posted it. I knew I shouldn’t have come back to check your blog before trying to go to sleep! Now I am going to open another bottle of wine and try to erase that image. It makes the Rog-Majal look almost classical. Why??? Why’d they do it??? LOL. It really does look like that mammoth below. How in the world does this happen? Who in the world would give to the building fund, if they had seen the plans? I was thinking sandcrawler too and then saw that! LOL!. It seems that this St Monica church is in a town run by Izquierda Unida (formerly known as the Spanish Communist Party). It is the only town in Spain with an Office of Apostasy, with a sign that says “the only church that illuminates is the one that is burning”. And until “the powerful Corsini family” donated the land for the church the parishioners had Mass in a garage for nine years. The trendier-than-thou Catholic architect managed to get various artists to donate their work… This thing won the “Best church design of 2008” award from “the prestigious” Wallpaper magazine. The architect is obviously proud of his work, though he was disappointed about the bishop’s decision to veto his “central altar” design and insisted on an altar against the east wall with reredos. He countered by designing a “light reredos” which is lit by that hideous “explosion of prisms visible from the outside”. So, the good news is that all Masses are ad orientem thanks to the bishop. The third photo looks like Noah’s Ark! While we’re on church architecture, I’d like to see octagonal baptisteries and rood screens brought back. It was utterly stupid to design such a piece of garbage, but it was even more stupid to approve such design. Our Lord certainly deserves something much better. Too many clergy have no aesthetic taste whatsoever, and some of them seem to be so fond of “aggiornamento” that they think anything modern is good. Actually, “St. Monica’s” is probably exactly the right name for this monstrosity … it’ll take a lifetime of prayer and supplication for the Lord to turn this in the right direction (which, for this particular building, may probably include a razing and rebuilding)…!!! oh my goodness-how could anyone worship in that? It is not the outside that worries me, it is the interior. There is an Irish web-site which links broadcasts of daily Mass in various churches across Ireland. The interiors are horrific. The cost of which has enriched the architectural, building and church furnishing companies and denuded the buildings of any sense of The Real Presence residing therein. These interiors undoubtedly reflect what they believe – a load of garbage. PS That said, I remember when the renovated French Church, off Leicester Square in London, was opened [circa 1955]. Although modern, nonetheless it stll engendered that feeling one gets upon entering churches in which The Real Presence is undoubtedly residing. LOL I love the original comment on the third pic “Mah… no comment!”. Yes, that about sums it up ha! I immediately thought of Star Wars when I saw that first picture! LOL – you couldn’t make it up if you tried! Thanks Fr Z. Any Catholic architect who designs or Bishop who approves such abominations shall incur instant excommunication for aesthetic heresy. My eyes! My eyes! It hurts! There really is absolutely no excuse for that kind of thing. Thank you so much for providing that bit of relief at the end. It was really needed. Yes that puts the ug in ugly. How about featuring Gaudi’s La Familia Sagrada in Barcelona? That creeps me out too. I have to disagree. The external ornamentation of Sagrada Familia is very strange, but it still looks like a cathedral. And the interior, although still unfinished, is very traditional in its layout. Now the city fathers are planning to build a subway tunnel under the church (very stupid) but there’s strong opposition. And yeah, that is one of the ugliest sandcrawlers churches I’ve ever seen . . . . The last photo looks to me like Sant’Antimo, a restored church now occupied by reform minded Norbertines, originally from France. Some of their priests lived at the Convitto San Tommaso when I did. It’s ready for the long trudge from Gibraltar and the Algerian desert back to St Monica’s ancestral Thagastan home! 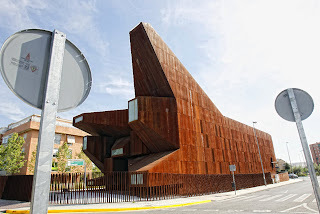 This ugly architecture is a result of separating the pursuit of Beauty from art. This began to happen in the early 20th century with “personal” art and now is rampant in so-called “statement art” and “political art”. Also, the prevalent idea that artists need only express their own emotions to be validated as artists leads to this sort of nightmarish, convoluted construct. I heard an artist on the CBC years ago stating that if she wanted to slap mud on a board and hang it in a museum, that her piece was “art” as it expressed what she was feeling at the time. Relativism reigns. Separate art from God, Who is Beauty, and from the pursuit of holiness, and garbage is the result. This dumpster church actually hurts my eyes, as well as my soul. Oh-my-word….what the heck is THAT? The last picture looks like something out of ‘Star Wars’! Or a troop carrier on D-Day! Vincenzo-you hit the jackpot again! You’re so imaginative-and it’s enough to put a smile on my face this Monday morning! If I had a bulldozer, I’d run that ‘church’ into the ground, too! When will they learn that Star Wars and architecture don’t mix? Inside it will be bowl like space with wooden walls, with benches without backs. But as for the last picture, I’ve actually been there, it is the Abbazia di Sant’Antimo, a heavenly place! That was great, Father. I’m crying from laughter. Those uh..buildings look like something the aliens brought with them. 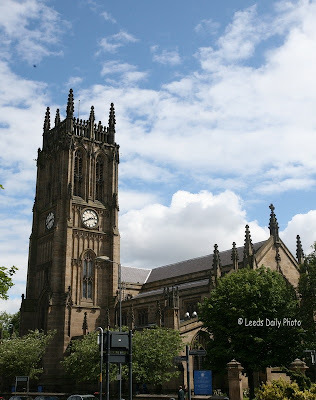 As a church, the building is an atrocity; however, in strictly secular architectual terms, I have to admit that I think it’s pretty intriguing. 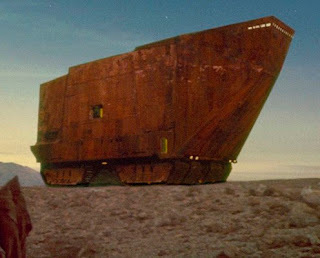 +1 kudos on the Jawa sandcrawler pic! (scroll down just a tad). And a church for Ewoks-thankfully not Catholic. I guess the Jawas are Catholic. How sad-looks like a roll of bubble wrap. must have been inspired by Picasso. I see Arrakis has its own diocese now. Those poky-out things with the windows on the ends remind me of some sort of weird creature. With eyestalks. I’ve been trying to recall where I’ve seen that before. Maybe a Gary Larson cartoon . . . . ?